Above A maglev train in Japan. It’s “an incredible experience” Hogan said of his 300-mile-an-hour ride on a test track in Japan during an economic development trip to Asia. Supporters of maglev (magnetic levitation) say a Washington-to-Baltimore route would cost a mere $10 billion. Others says the price tag would be many times higher just for the first 40 miles of a route eventually stretching to New York. Maglev glides on a cushion of air and is powered by super-conducting magnets. It requires a straight track and cannot use existing rail rights of way, so the Baltimore-Washington route through an intensely developed part of Maryland would have to be via a 40-mile-long tunnel. Now we’re talking REALLY big bucks. Yet there was Maryland’s governor calling maglev “the future of transportation” that would be “incredibly transformative” for Maryland’s economy. It’s one thing to be polite and complimentary to your host on an overseas economic venture. It’s quite another to join hands with the promoter, the Japanese government, to support a Japanese company’s technology and request $27.8 million from the U.S. government to study a speculative maglev route between the nation’s capital and Charm City. Just the notion that it won’t cost the state of Maryland one red cent if a Washington-to-Baltimore maglev becomes a reality — backers say it could be funded by Japan, a Japanese railroad and the U.S. government — is enough to wonder what was in the water Hogan drank while in Tokyo. Sure, it’s a great technology on a test track. But the first maglev train, built in Shanghai, China, has been a flop. That line is only 18 miles long, linking Shanghai’s international airport with a suburb: You still have to transfer to a cab or a light-rail line to reach Shanghai’s downtown. That route was built by German companies as a sales tool. It didn’t work. When it came time to select a technology for an 800-mile super-speed line between Shanghai and Beijing, the Chinese government chose a proven, wheels-on-track bullet-train. Shouldn’t that tell Hogan something? Better to improve what you have with the limited transportation money on hand than jump into a questionable technology that isn’t ready for prime time and costs a fortune. Does Hogan truly expect the budget-cutting Republican Congress to approve spending tens of billions of dollars on a maglev route through a heavily Democratic state? Where’s the money going to come from now that Congress refuses to raise the federal gasoline tax — the main source of federal transportation funding? Congress almost certainly would require Maryland to ante up a big chunk of the money, 50 percent or more. A decision on the Red Line for Baltimore, an absolutely pivotal project. A decision on the Washington area’s Purple Line serving the state’s two most populous and congested counties. A decision on a badly needed new rail tunnel through Baltimore. This directly affects the future of Maryland’s leading economic engine — the Port of Baltimore. A decision on vastly improving Maryland’s commuter-rail line, MARC, so that its popularity continues to grow. A decision on major repairs or replacement of railroad bridges over the Susquehanna, Bush and Gunpowder rivers. A decision on how quickly to repair/replace dozens of deteriorating highway bridges throughout Maryland. A decision on replacing the scary, congested, 75-year-old, two-lane, deteriorating Gov. Harry W. Nice Bridge over the Potomac River in Southern Maryland — a billion-dollar-plus project. With all this on his transportation plate, why in the world would Hogan champion a highly questionable maglev project with a stratospheric price tag and a completion date so far in the future it can’t be seen? Maglev is a great idea yet to be fully proven as a power source for long-distance travel. Oodles of engineering and technical issues remain unresolved. Huge political and geographic obstacles remain. Isn’t it far more sensible to improve existing rail lines and projects nearing the construction stage? 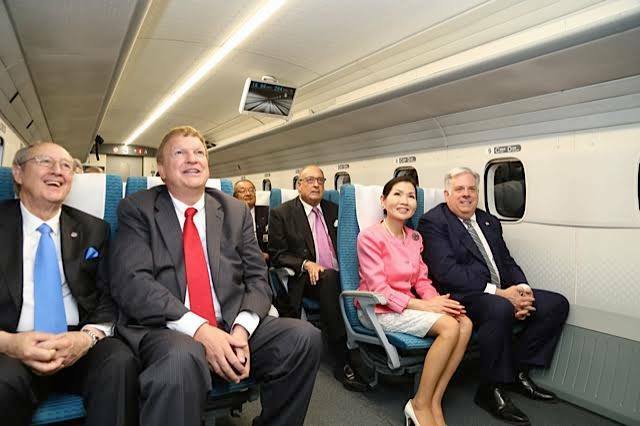 Hogan didn’t help himself by making glowing maglev comments, signing a memorandum of cooperation with the Japanese government on maglev and announcing that he’s seeking federal funds to study a high-speed route in Maryland. Instead, he needs to get serious about easing travel for Marylanders today, especially in the state’s most crowded regions. Maglev should be taken off the table. Barry Rascovar’s blog is www.politicalmaryland.com. He can be reached at bracovar@hotmail.com.